New England Patriots TE Breakdown: Patriots Success is dependent on Health of Gronkowski | NFL News, as it happens, when it happens. Your one stop shop. There may not be a more important position for the New England Patriots outside of Quarterback than the TE, with the Patriots ranking 2nd in receptions, and 1st in both yards and touchdowns coming from the position in 2014. Those rankings are due in very large part thanks to Rob Gronkowski’s monster regular season where he was ranked #1 among all NFL TE in yards, average per catch, yards per game, receptions of twenty plus yards, first downs and touchdowns (NFL.com). 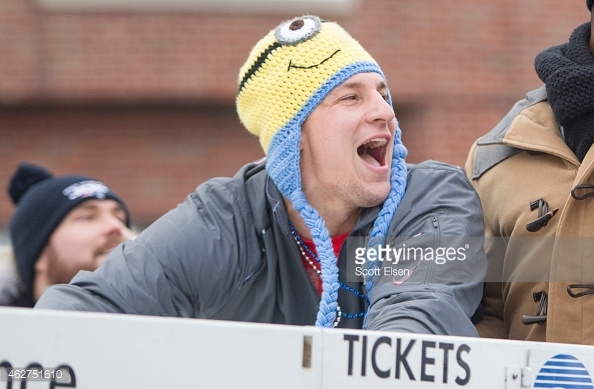 The only stat Gronkowski didn’t come in first was receptions where he ranked 4th in the NFL. He is no question the best at his position in the league when healthy, and the Patriots success in 2015 will count on Gronk staying on the field throughout the regular and post season. No doubt the question at the position is the second and third slots on the depth chart. New comer Scott Chandler looks to be #2 at the TE slot when the 2015 regular season starts and he is absolutely no stranger to the Pats Nation having played the team twice a year since 2011. Chandler was often a thorn in the side of the Patriots defense during those games accounting for 4TD’s and over 350yds in those 8 games (pro-football-reference.com). At 6-7 and 280lbs Scott will be another monster big man for Tom Brady to target down field and in the end zone. The third slot may be a bit of a question mark. With veteran TE Michael Hoomanawanui, rookie big man out of Arkansas AJ Derby, and converted DE Jake Bequette making the move to the offensive position. The “Hooman” had a significant drop in production last year catching only 3 passes with no scores and missing blocks all over the place allowing for the edge to get to Brady in the backfield. AJ Derby was selected in the 6th round with the 202nd pick and has high upside as a TE in the NFL. He is fast for a big man running a 4.69 40yrd dash at the 2015 NFL combine with his only downside being that he had only one year at the position in Arkansas system. The lack of experience shouldn’t outweigh his ability to line up all over the field with speed and size. Bill Belichick thinks Jake Bequette is “in good position to compete” for a spot at TE after swapping his DE position for the end on the offensive side of the ball. He does have some experience at the position playing TE in high school and his first year as a redshirt freshman at Arkansas.